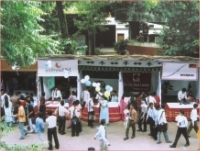 “Job fair" is a very new concept in Bangladesh. With the number of qualified graduates increasing every year the importance of a job fair can hardly be overemphasised. The ultimate goal of a student is to get a quality job and secure a desired standard of living after obtaining the degree. UNITED International University celebrated third anniversary with a weeklong colourful event from September 3 to September 8. Among the 111 medical students who graduated this year from DMC some 70 students went on the trip. They spent the day playing games in the water world.